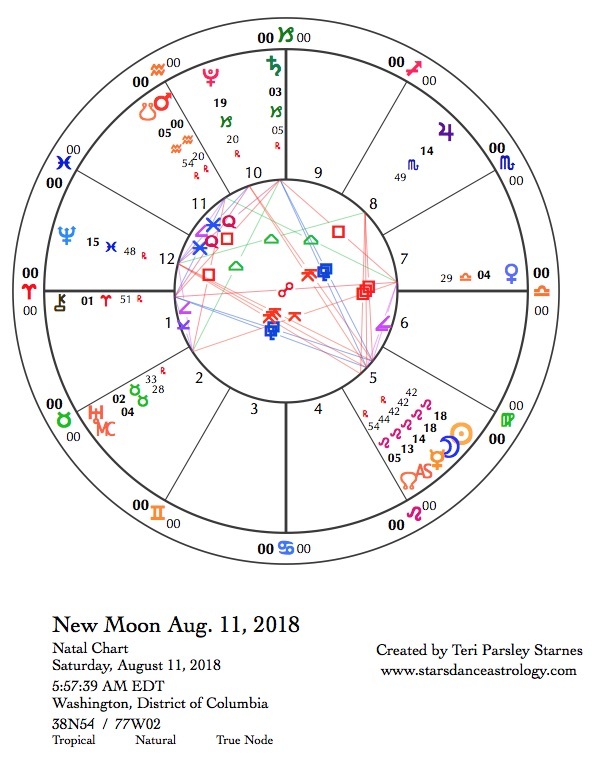 August 11—New Moon: Seeding. Solar Eclipse. Good news: Eclipse seasons intensify transformation. Bad news: Eclipse seasons intensify transformation. We are in the middle of a potent eclipse season. Good and bad news. An eclipse season happens a little short of every 6 months. The typical eclipse season will include one solar and one lunar eclipse. Sometimes the lunar eclipse happens first and sometimes the solar eclipse happens first. On rarer occasions, there will be three eclipses in a row. We are having that kind of eclipse season this time. 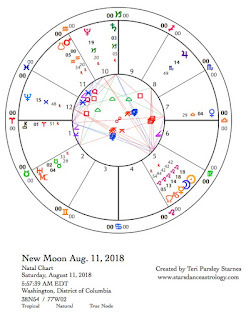 This time, there was a partial solar eclipse in Cancer on July 13, a total lunar eclipse in Aquarius on July 27, and another partial solar eclipse in Leo on August 11. According to the Earth Sky website: “The last time a total lunar eclipse and two partial solar eclipses happened in one lunar month was in 2011 and the next time will be 2029.” The current celestial influences stand out as unique and intense. Another unusual feature of this eclipse season is the number of planets appearing to move backward. At the August 11 new Moon, there will be six or perhaps seven, if you count Chiron, retrograde planets. That’s a lot of retrograde. Planets don’t really move backward, they just appear to due to the relative position between the Earth and other planets. We are just in the right place and time to be experiencing this influence. Eclipses also only happen when alignment is just right. At this moment, it feels like we are aligning with big forces. Eclipse seasons intensify transformations. Retrogrades intensify turning inward, reflection, and surrendering control. Even though we are transforming, it can also feel like nothing is happening. We are suspended in this moment of alignment. Witches see such moments of alignment as portals into magic. The particular portal of the August 11 new Moon is colored by Leo’s golden rays. This noble sign offers our challenges and gifts this season. Leo is the fixed fire sign ruled by the Sun. The Sun is the center of our solar system. It represents the center of our selves, too. The Sun symbolizes selfhood, ego, and unifying purpose. The Sun and its sign tell us of our mission in life. The Sun is generous and life-giving. It can also burn and annihilate. Leo is the sign that strives to be in right relationship to this power. Leo represents our essential nobility—the human characteristic that holds intention towards life and is ready to act on its behalf. There are many possible and fruitful intentions to hold for this Leo-inspired lunar cycle. Mine will be to cultivate kindness towards myself. I’m ready. I’ve tried muscling, burning and slashing, and shaming myself into transformation. I’ve seen myself as deficient. I’ve fought against the world to claim my position. I am exhausted by the struggle. I am wondering what kindness instead will do. After realizing this was my intention in the season of Leo, I began to wonder if there is a connection between the words ‘kind’ and ‘king.’ There is and it comes by way of kinship. I am both my own kin and my own king when I practice kindness towards myself. This is the seed that gives entry into this magic. This retrograde season is a time to surrender the fight. The journey back and into deeper places reveals that I have always had everything I need inside. I can be kind towards the self that had to struggle so hard. I can be kind and curious about how that self will claim the Sun of regeneration and life next. Who will emerge from the eclipsed Sun and inward journey? I share my process here because I hope my journey is instructive for others. This is an offering of companionship as we follow the Moon. What will your intention be through this lunar cycle? How will the Sun inspire you? The Sun illuminates. Eclipses darken. May we greet the dark and the light with kindness. We embark on another transformative lunar cycle. The past one wasn’t exactly easy. The situation is stressful. One recent, notable stressor has come from Mercury retrograding through Leo (since July 25). The usual miscommunications due to retrograde shenanigans became more personal and passionate under Leo influence. Arguments have been augmented by this fire sign. Another stressor has been the ongoing influence of Jupiter in Scorpio (since October 2017), which has been asking us to go deep into the shadows. With Jupiter here, we’ve exposed, purged, and transformed. Now, through a square between Mercury and Jupiter at the new Moon, inhibitions are loosened. Personal, revelatory, and unexpected communication could result. Insights can be piercing and accurate, but be careful of the words that hurt. This influence is a challenge to the practice of kindness this month. I am wondering can our words be true, passionate, and kind at the same time? What does that look like? Retrograde influence begins to lessen over the course of this lunar cycle when, first Mercury turns direct on August 18, and then Mars in Capricorn turns direct on August 27. Life will speed up again. Even if these retrogrades feel stressful, we can still use them to pause and reflect on how we wish to meet new momentum. Another transit that encourages reflection is the 3rd and final trine between Jupiter and Neptune in Pisces (August 19). Neptune never operates in ordinary time. Since this aspect between Neptune and Jupiter first perfected in December 2017, we’ve been in a more fluid, impressionistic, and intuitive time stream. This feels both vulnerable and healing at once. It is possible we feel our angels and allies coming to help us through the hard stuff. The dream time takes on the mantle of reality when Saturn in Capricorn turns direct at the end of this lunar cycle (September 6). As the Sun in pragmatic Virgo opposes Neptune on September 7, we are encouraged to bridge emotion and work. What is beautifully pragmatic? What is constructively ecstatic? Throughout the lunar cycle, I will be exploring kindness, wondering if this journey can be made more powerfully regenerative by surrendering the battle I’ve been fighting with myself. Can love finally win? Let’s step into the darkness to find out.